A total of 20 universities and colleges all over National Capital region and Luzon consisted of 70 young aspiring chefs and 38 chefs-coaches showcased their innovation, culinary skills, creativity and mastery in the 2018 Philippine Food Expo Culinary challenge which highlighted the mastery of Philippine Cuisines. All the categories were mixtures of students from Hotel and Restaurant Management course or other related courses and student and coach-chef competed for the title in the different categories. The National College of Business and Arts’ Hotel and Restaurant Department Fairview Campus consisted of two entries which battled for the Food Styling and Photography, an on the spot Filipino Food Styling Competition. A combination of art and culinary skills and food must be fitted for consumption. All dishes must be photographed ready for presentation. Team Paella Negra composed of Michael Cuevas and Regina Esperanza, and Team Arroz Caldo composed of Joenard Bernardo and Camille Cordova. Team Arroz Caldo won as First runner-up, out of 16 entries from different universities and colleges in National Capital Region. While Dino Balidoy and his Coach Chester Mogol bagged the CHAMPIONSHIP TITLE for Kitchen Master 2018, an unconventionally timed cooking competition, where the participants must prepare one (1) appetizer, one (1) main course and one (1) dessert good for two (2) within 30 minutes only. This consisted of 10 competing universities and colleges in NCR and all over Luzon. The Philippine Food Expo 2018 Culinary challenge aims to enhance relationship among the different Universities/Colleges in the Philippines in order to develop the students and industry practitioners in gaining and applying knowledge on the latest trends and innovations in Hotel and Restaurant operations, to foster friendly and healthy competition among students and faculty from Colleges/Universities, to focus on the culinary skills and artistry of future chefs, to showcase the various elements of the food and beverage services in the Hotel and Restaurant and tourism industry, as well as to enhance the education on nutrition and healthy cooking, and to showcase students and the general public with an experience of a student competition and exhibition of food preparation and services in the hospitality industry. 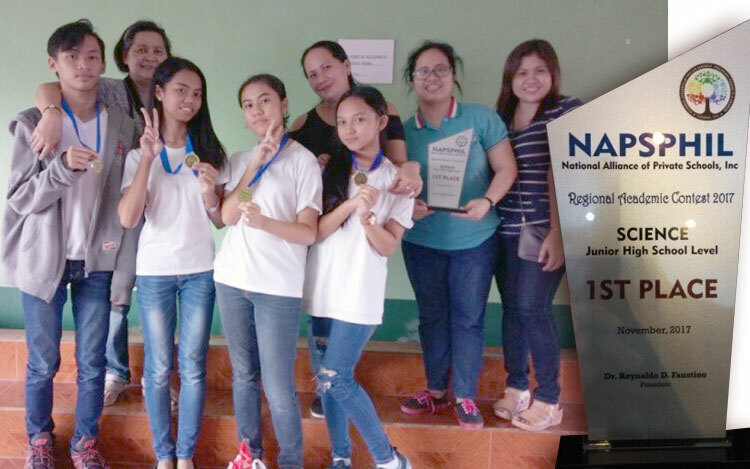 National Alliance of Private Schools Philippines (NAPSPHIL) is one of the well knowned Regional associations for launching not only sports, literary and musical but even academic competitions annually. Last November 25, 2017, the NAPSPHIL or Regional Academic Competition was held at Santa Teresa College located at Bauan, Batanggas. With their coach, Ms. Katrina S. Dela Paz, Our Junior High School Science team which consists of Elaine Luna of Grade 7- Narra, Samantha Francisco of Grade 8 – Mt. Apo, Audrey James Ilaga of Grade 9 – Jacinto and Christel Delfin of Grade 10 – Diamond won 1st place against other schools from CALABARZON. The Elementary Department of the National College of Business and Arts, Taytay Branch joined the Taytay Private Schools Association (TAPRISA) Academic Contest held last November 8, 2017 at Golden Faith Academy, Taytay Rizal. Our contestants in Math (Intermediate Level) namely Martin Rafael M. Suallo, Nygene Ylise G. Mendoza and Trixcy M. Lachica headed by their coach Abelardo C. Cardijon won 1st place in the said competition. They were up against 22 participating private schools in the municipality of Taytay. 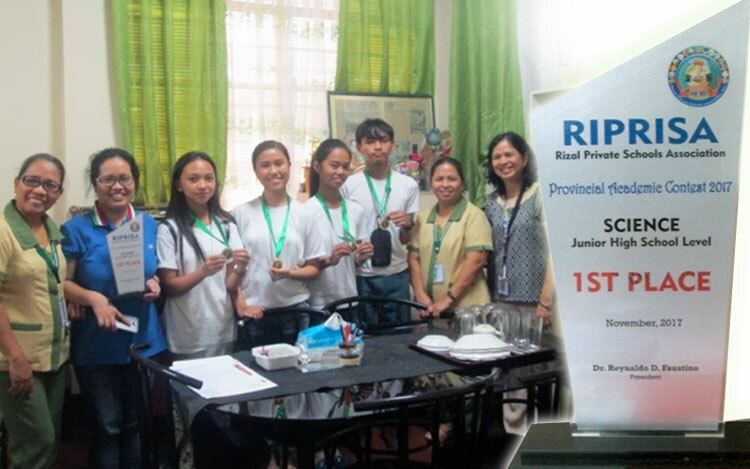 They also won 4th place in Rizal Private School Association (RIPRISA) Academic Contest held last November 14, 2017 at Juan Sumulong Junior Memorial College, Taytay Rizal. For 21 years of serving the Food and Beverage Industry, Foods and Drinks Asia held its International Exposition on Specialty Food, Delicatessen, Confectionery, Beverages, Beers, Wines and Spirits, The Food and Drinks Asia 2017. It was held on the 9th of September 2017 at the World Trade Center in Manila, Philippines. The event highlights the “Food and Drinks Asia Cooking Challenge 2017” with a theme of ‘the Philippine Cuisine Regional Fusion’. Wherein the National College of Business and Arts – Fairview Campus participated and had left footprints to this expo. It all started when the head of the HRM Department, Mr. Chester E. Mogol, had received an invitation to participate in the upcoming, Food and Drinks Asia Cooking Challenge 2017. As Mr. Mogol saw it, it was an opportunity to expand their knowledge, to gain new experiences, to learn more about creativity, to acquire more skills and ability in cooking techniques and food presentation, and to, again, earn a name in the culinary industry. They had given the needed requirements and started in carefully picking the students who will compete. Mr. Chester Mogol and Mrs. Roda Gonzales saw potentials in Mr. Dino B. Balidoy and Mr. John Carlo B.Dela Torre, and was the chosen students that represented the whole NCBA Fairview, Taytay and Cubao in the Food and Drinks Asia Cooking Challenge 2017. When asked why, Mr. Mogol said, “Carlo has potential both in knife skills and cooking skills. While Dino is the contrast of Carlo, which focuses on plating, presentation and flavor development and taste.” A perfect combination isn’t it? After declaring that they’ll compete, they started in the brainstorming of what kind of food they will present. And it all comes down to three regions and three of their specialty dishes, combined into one unique and extraordinary dish. They named the well thought dish, “TinapangcBangus sa Pancit Lucban with Kinunot Sauce”. TinapangBangus of Pangasinan (Region I), Pancit Lukban of Quezon (Region IV-A), and Kinunot Sauce of Bicol (Region V). It is a dish that showcases the creativity and flexibility of the mentors and students and their ability to exhibit food with high complexity of flavors but has this distinguished taste to it. But before all that, they had to make some discoveries and techniques of their own. There had been challenges, and for the team it was how to retain the smoke in cooking the tinapangbangus. They used hays in producing smoke but the problem was that the fire goes out faster than what was expected, thus its flavor did not stick on the bangus. Instead of abandoning their ideas, they find ways through it. They add more ‘almost-dry’ hays, small chunks of woods and fresh leaves of celery, because less dry leaves produce more smoke. They had to put hays on fire, threw in the torched wood, topped with fresh celery leaves, and made more small clouds of fragrant smoke. With that resolved, they continued practicing with small hitches along the way. And in three weeks’ time, particularly every Tuesdays and Thursdays, they kept on practicing and sharpening their skills. The day of the competition arrived and everybody was both anxious and excited. Anxious because anything can happen by the end of it, because the wheel is round and spinning, they might be at the top or bottom and no one could tell. Excited about having new experiences and demonstrating our abilities and skills in cooking. So when the team got there, they are one of the last groups to arrive and prepare. But that did not became a hindrance for them. At around 2:30 pm, the competition started for the first batch, where they were included as Team #3. They first did the miseen place, cleaned they’re station and then started in cooking. Everyone was amazed and mesmerized to the team when they made a high flare of fire for smoking purposes, as everyone could hear ‘ohhs’ and ‘ahhs’ of other students . The judges were left intrigued about their technique of cooking, the taste of the finished food and their overall performance.They fired questions to the team, nervous but standing their ground, Mr. Dela Torre and Mr. Balidoy answered equally. They were on faster pace compared to what they do in practices. Keeping calm under pressure, both in time and the observant eyes of the judges, is absolutely difficult especially when you have to do something cautiously. Thankfully, they finished it on time. When it was presented in a line up for the judge to taste and for a feedback, they were astounded of the peculiar mixture of taste. One judge said, “Beautifully presented. Magandaang technique ng plating, napaka-creative ng cooking technique. It lacks in flavor, at maytinik, but it is the ideal dish that represents ‘food fusion.’” They mentioned how the taste of three different regions complimented each other. It may lack in a few components of flavor they want to go for but they expressed how much they enjoyed the complexity of the taste made by combining the three different dishes. It was nerve-racking to stay and wait for the announcement, when there were still 2nd and 3rd batch to finish. And by the time when it had to be announced, every one of us were already sweating profusely. Gripping tightly to whatever we were holding, everybody’s nerve spiked at the announcement of the 2nd place winner. Out of the 13 participating schools, the National College of Business and Arts – Fairview Campus attained to be one of the top schools to compete. Something that we should all be proud about. It is no joke to compete with schools who are well-known, having big names of their own and beating it in this competition and earning a spot with two reputable schools is worth a celebration. With that, we all went home feeling fortunate and humbled, but having a sense of pride. At the end of it all, they flourished their skills and took home the second place in the “Foods and Drinks AsiaCooking Challenge 2017”. National College of Business and Arts (NCBA) had once again proven its quality instruction after another list of its BS Accountancy graduates, hurdled the May, 2017 CPA Board Examination given by the Professional Regulations Commission (PRC). ABAD, NIMFA F. LAGCAO, DENDYROSE I.
AQUINO, ADELE RACHEL M. LAPLANA, PAUL BLOTIR B.
ARIZALA, GIO MIGUEL D. LAPUZ, CHARLENE C.
BANCASO, ARLENE B. LIM, YVES E.
CAÑAFRANCIA, FLOREVIC T. LOZANO, JANINE C.
CASTRO, MIRA NERISSA M. MENDOZA, JANINE N.
CIRUELA, PAOLO DAVID J. NACIONALES, HEZEL A.
CONCEPCION, ROBERT FRANCIS M. NATAÑO, CLOIE LOUISE U.
CORPUZ, AICA D. PADILLA, CHRISTELLE MARIE C.
CRUZ, HANNAH RAFFA G. QUIOHILAG, CARL LOUIE C.
CRUZ, JELLY ANN C. RAMOS, MISHAEL C.
DEMONTEVERDE, NICOLE L. SAGARAL, ANDREA FATIMA M.
DIMATUNDAY, ALINOR Y. SARUSAL, PORCIA ANN A.
DIMAYUGA, MARK ARNIE M. TALAMAYAN, RAY MONN D.
DULDULAO, FERDINAND, JR. TOMAS, ROMINA B.
EGNAL, JOSEPH LEO A. TORRES, JEANABLE L.
EJE, BRYLE Y. VALDEZ, MA LUISA A.
FLORES, MARY JOY D. VEGA, SHAIRA M.